This factsheet explains how Family Tax Benefit (FTB) works when the care of children is shared, most frequently in the event of divorce or separation. It also explains how to deal with problems that can arise, particularly when two carers do not agree on the “percentage of care” that should apply. If an adult has less than 14% of the care, they cannot receive any family assistance for the child. The assessment period for working out the percentage of care starts from the day care starts or changes, and runs until there is another change in care. A care period of 12 months will generally be used when the arrangements are ongoing. Generally for a 12 month period, the 35% minimum care rule is satisfied where a person cares for the child for at least 128 days in that year. To work out how FTB is to be shared, a “pattern of care” must be established to work out what percentage of time each adult cares for the child. 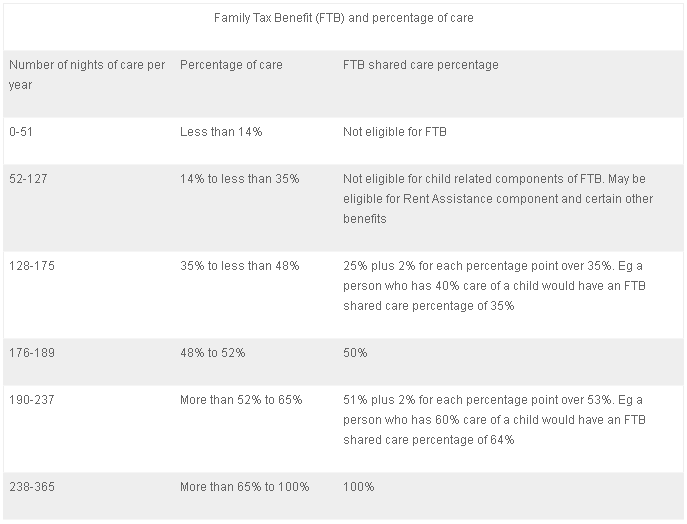 This percentage is then applied when calculating the rate of Family Tax Benefit A and B that each adult can receive. The table below summarises the percentage of FTB that will be paid. If “number of nights” is not an accurate reflection of the pattern of care, in some cases, care can be expressed in hours and converted into days to establish a pattern of care. Who decides what the percentage of care is? Centrelink’s Family Assistance Office or the Child Support Agency make a determination about the pattern of care that each relevant carer provides for a Family Tax Benefit child, and then informs the other agency automatically. This pattern of care then gets converted into a percentage rate that decides how the FTB is split. If both adults agree on the actual pattern of care for the child, the agreed pattern of care is used. If both adults disagree, Centrelink must decide what the actual pattern of care is, on the basis of available evidence, even if a formal care arrangement exists according to court orders. Each adult will be asked to provide additional evidence to support what they say in order for the Family Assistance Office to make a decision. If you do not agree with the percentage of care that Centrelink or the Child Support Agency decide you have, you have the right to appeal. An assessment by Centrelink or the Child Support Agency is binding for both agencies. If the decision is made by Centrelink, you can appeal to an Authorised Review Officer in Centrelink. If the decision is made by the Child Support Agency, you can lodge an appeal with the Child Support Agency or to an Authorised Review Officer in Centrelink. If that doesn’t work, you have the right to appeal to the Social Security Appeals Tribunal. How can I prove my percentage of care? records from a government agency (like the Child Support Agency) who might be able to confirm current or previous patterns of care. A decision maker will usually speak to you, speak to the other carer, look at any evidence submitted, and then make up their own mind about what percentage of care to apply in your case. Welfare Rights Centres often can’t act for you against another carer. This is because we don’t want to be “conflicted out” of helping as many people as we can with their problems with Centrelink. You could contact your local Legal Aid Child Support specialist service to see if they could help you. Centrelink’s Family Assistance Office and the Child Support Agency can each make a determination about the pattern of car and this decision is then applicable to the other agency automatically. Legal Aid Child Support Service in NSW can be reached on 96339916 (Sydney) or 1800 451 784 (regional). Problems can arise when one person receives FTB by instalments based on a certain percentage, but then another person claims FTB later (eg at the end of the year) and claims to have a higher percentage of care than Centrelink had applied. For example, Susie receives instalments of 100% of FTB through the financial year on the basis that she has care of her son Tom 70% of the time. However at the end of the financial year, her ex-partner Jason lodges a claim for FTB stating that he has 35% care of Tom. If she agrees with the decision, she might still have grounds to have the debt waived if it was caused by Centrelink error or if she has special circumstances. If you disagree with a debt raised on the basis of the percentage of care you had of a child over a past period, you have the right to appeal. You can present your case to a decision maker and ask them to make a decision that you had a different percentage of care. The same sorts of evidence referred to under “how can I prove my percentage of care” on page 2 would be relevant to your appeal. If you agree with the percentage of care basis for the debt, but would like the debt waived in view of your special circumstances and in view of the fact you did not realize you were being overpaid at the time, you have the right to ask that the debt be waived (meaning it does not have to be paid back). See our factsheet “Debts” for more information about this. – is most in need of the payment. – whether one parent has already been receiving Parenting Payment for the child. 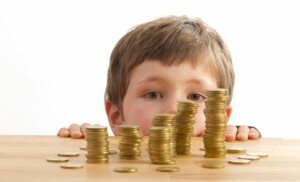 Child Care Benefit and Rebate are paid to the person liable to pay the child care fees. If you think a Centrelink decision is wrong, you have the right to appeal. Appealing is easy and free. To appeal simply tell Centrelink that you are not happy with their decision and that you would like to appeal to an Authorised Review Officer (ARO). You can appeal to an ARO at any time. However for an FTB past period decision, your appeal needs to be lodged within 52 weeks from the date of the decision, or by 30 June for the financial year after the one you are appealing about – whichever date is the later one. To claim FTB for a past period, you need to lodge your claim within 12 months of the relevant financial year you are claiming for. There is no time limit to ask to waive a family assistance payment debt. Different time limits may apply to appealing decisions through the Child Support Agency. If you think the ARO decision is wrong you have further appeal rights, and time limits apply. For more information see our factsheet “Appeals – how to appeal against a Centrelink decision”.